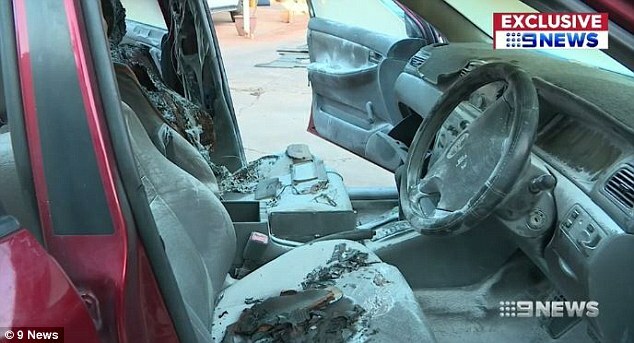 A fire that destroyed the interior of a rental car that suddenly burst into flames could have been caused by a mobile phone that was left on the passenger seat. Darwin dad Matthew Mansfield returned to his parked rental car to find that it had been set on fire and completely burned out. Mr Mansfield’s Samsung Galaxy Core Prime mobile phone was on the passenger seat at the time of the incident and it’s believed it may have ignited the fire. It was a hot day in the Northern Territory, but Mr Mansfield told Nine News he parked the car in the shade and that his mobile phone was left partially under a book. Mr Mansfield purchased the Samsung Galaxy Core Prime from a store in Tasmania two years ago, but he isn’t the only person to have had a fiery problem with a Samsung phone. In 2016, the phone maker was thrust into the spotlight after several reports of the Galaxy Note 7 model exploding and bursting into flames just weeks after it was released. After nearly 100 reported incidents of the device overheating and sometimes injuring people, the Galaxy Note 7 was banned from all airline flights and eventually recalled, costing Samsung billions. Another 2017 incident, where a Samsung Galaxy S4 allegedly exploded in a schoolgirl’s lap, ended with the 15-year-old getting second degree burns around her thighs, The Herald Sun reported. Despite several reports about other Samsung phones exploding, the Galaxy Core Prime has never been recalled. 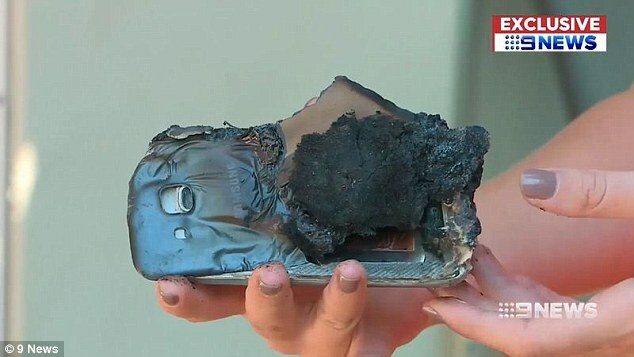 Samsung told Daily Mail Australia it was ‘very unlikely’ the Galaxy Core Prime was the cause of the car fire, and they believed the phone was ‘safe’, despite photos of the burned out car and phone. Mr Mansfield contacted Samsung about the incident and they have offered to replace his phone – but he has declined, saying it’s too risky. ‘It could have happened if I was at a servo and I had my daughter and sons in there,’ Mr Mansfield said. Samsung told Daily Mail Australia the company was ‘eager’ to inspect the device and conduct a full investigation. ‘Product quality and customer safety are our top priorities at Samsung and we are relieved to learn that the customer was not injured,’ the company said.